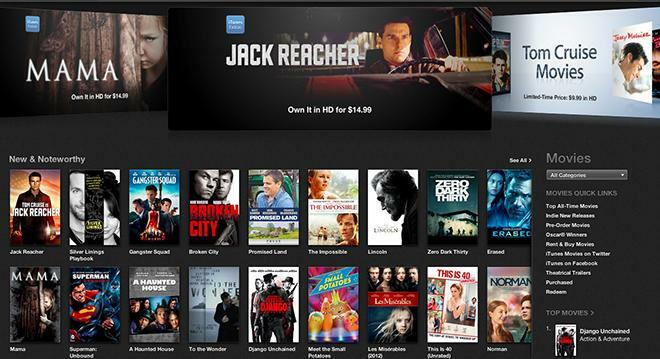 Apple's iTunes store is a force in music, movies, television, books, and apps. The NPD Group on Tuesday released new figures on the home digital-video sector, finding Apple holding a 67 percent share of the digital TV download market, as well as a 65 percent share of the movie market. No competitor comes close, as Apple outstrips the closest individual services  Microsoft's Xbox Video and Amazon's Instant Video  several times over. Xbox Video accounted for 10 percent of electronic sell-throughs in movies and 14 percent for TV shows, NPD's figures showed. Amazon's Instant Video accounted for 10 percent in movies and eight percent in TV shows. All other services outside of iTunes, Xbox, and Amazon amounted to 16 percent share for movies and 10 percent share for TV shows. The Internet video-on-demand (iVOD) sector saw Apple's lead persist, though at a less extreme degree. Apple grabbed 45 percent market share of online movie rentals, more than twice that of its next competitor, Amazon. After Amazon's second-place finish with 18 percent, the field rounded out with VUDU and Xbox Video, with 15 and 14 percent, respectively. All other providers amounted to eight percent share. "Apple has successfully leveraged its first-mover advantage and of iTunes, iOS and the popularity of iPhone and iPad to dominate the digital sale and rental markets for movies and music," senior NPD analyst Russ Crupnick said. "While worthy competitors have come along, no other retailer has so thoroughly dominated its core entertainment product categories for so long." The report attributes Apple's dominance in the segment to a high level of customer satisfaction, finding that eight out of 10 iTunes video customers rated their shopping experience as excellent or very good. Similar percentages were satisfied with the service's number of current releases and selection. As the study only measures video content that is purchased by consumers for permanent ownership, it may not reflect the entirety of the video consumption market. It does not, for example, take into account Netflix, which is known to be one of the largest consumers of Internet bandwidth in the world due to the popularity of its streaming service. iTunes music, video, and app download services have become a significant cash generator for Apple thanks to the popularity of the company's iDevices. As in video, iTunes controls a massive slice of the digital music market, with a 63 percent share. The service is now estimated to pull in more than $2 billion per year for Apple.